All right, but how much does a yard of sand weigh? What if I use concrete? Our sand calculator is a tool designed specifically to help you with the calculations on the building site. Estimating the required amount of any building material is a difficult task, and errors may result either in running out of materials when all machines are in full swing, or in heaps of sand lying around after the earthworks are completed. Use this sand calculator or our paver sand calculator to answer the question "how much sand do I need" and never worry about it again! Determine the length and width of a cuboidal excavation. For example, we can assume an excavation of length L = 12 yd and width b = 3 yd. Calculate the area of the excavation, multiplying the length by width. In our case, A = 12 * 3 = 36 yd^2. You can also type the area of the excavation directly into our calculator if you choose an excavation of some more sophisticated shape. Establish the depth of the excavation. Let's say it's d = 0.5 yd. Multiply the area and depth of the excavation to obtain its volume: 36 * 0.5 = 18 cu yd. The volume of sand required is equal to the volume of excavation. Our sand calculator will display this value for you. To calculate the weight of a cubic yard of sand, you simply have to multiply the volume by density. 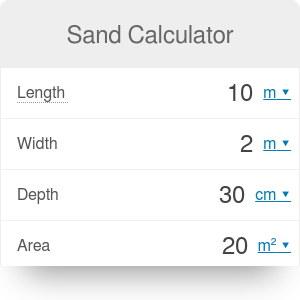 You don't have to remember the density of sand, though - our calculator has a set value for density so you don't have to type it in manually. Of course, if you decide to use some unusual material, feel free to change the value! Once you know the total weigh of sand you have to buy, you won't have to worry about overspending on building materials. But how much exactly will you spend? Our sand calculator can help you with that - all you have to do is enter the price of sand (per unit of mass, such as tonne, or per unit of volume, for example cubic yard). The calculator will display the total cost of the sand you need. Then head to our concrete estimator to calculate the number of bags of cement needed to cast concrete elements of given dimensions. Sand Calculator can be embedded on your website to enrich the content you wrote and make it easier for your visitors to understand your message.